The two city youngsters who brought home gold and silver medals from the Pan Kids Jiu-Jitsu Championship which took place in California earlier in the month received citations from the municipal council. “I represented my town,” said a proud Jason Lambert Dixon Jr., 8. He and his step brother Jalen Malik Mitchell, 9, traveled to California with their parents to compete in the championship on February 14th, 2016. “It’s not every day a Patersonian can say he won the gold medal,” said Andre Sayegh, 6th Ward councilman, who recognized the two School 9 third graders. The councilman represents the area where the family lives. Dixon won first place earning a gold medal in the Pee-Wee 3 boys super heavy category while his brother won second place obtaining a silver medal in the Junior 1 boys feather category, according to the International Brazilian Jiu-Jitsu Federation final results. “These boys worked so hard. They scarified their free time. They always challenged themselves,” said Naji Mitchell, the father. Most of their competitors had five years of training while the two brothers had trained for two years, pointed out Sayegh. “They competed against the best of the best in the world,” he said. Both the father and the mother Tracia McDonald see a bright future for the two boys as they prepare for the American nationals in Las Vegas in July. “I’m excited about their future,” said the father. 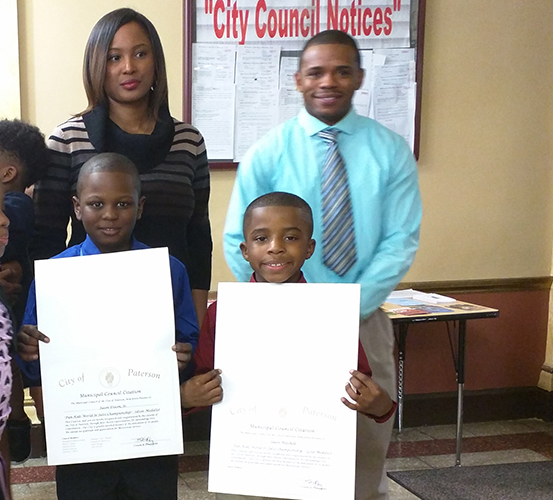 The boys accepted the citation certificates from governing body and received great cheers from a packed city council audience on Tuesday night. “Paterson should be proud of these two champions,” said Sayegh.